As many of you know, on Sunday night I flew back to the UK as my dad is in hospital. He has double pneumonia and is on oxygen, but seems to now be responding to the treatment. Please hold him and my mum in your prayers. 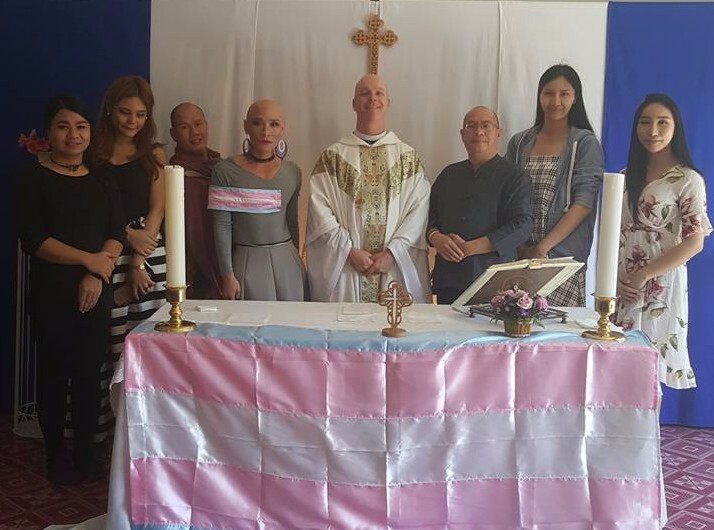 Last week we had a very moving service for the Transgender Day of Remembrance, in which a number of the ladies from M-Plus took part. We thank God for their presence with us and for all the good work M-Plus does amongst the LGBT community in Chiang Mai. This week is the Feast of Christ the King. Taylor Pfaff will be preaching, Mark Crawford will be presiding at communion, Debbie Kramlich will be playing the organ, and our deacon Gene will be coordinating everything as usual! We are very blessed to have such wonderful people in our church. I should be back next week for Advent Sunday, which will be followed by a potluck and decorating the church for Christmas! Our readings for this Sunday are Ezekiel 34:11-16, 20-24, Ephesians 1:15-23, and Matthew 25:31-46, and the hymns are All Creatures of our God and King, When I needed a Neighbour, The King of Love My Shepherd Is, and The Lord’s My Shepherd. This week’s Theology on Tap is cancelled. The final one for this session should be on 8th December! Christmas is coming soon! Next week we will be celebrating Advent Sunday as we decorate the church. Put this important event in your diary! The two posters shown below are now available for distribution at the back of the church. Please take them. We particularly need to make sure that a Nine Lessons and Carols poster is in every Rimping supermarket. They need to be handed in at the information desks before 1st December for display for the next two weeks. 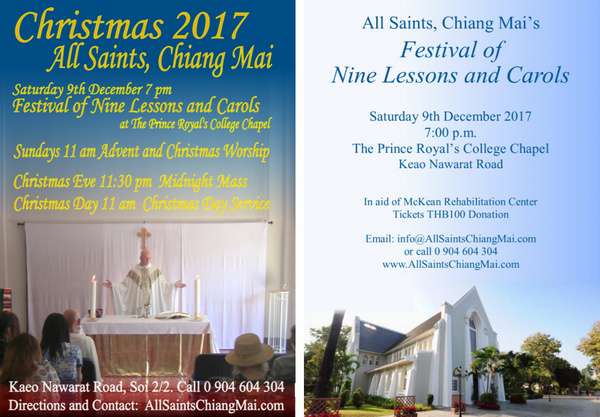 Tickets are now available for the Nine Lessons and Carols. Please take as many as you can to sell to your friends, family, colleagues, neighbours, enemies (we have to love them too), and acquaintances. Just bring the money and put it in the jar at the back of church. Advent Sunday. December 3rd 11 a.m.
Service followed by potluck and decorating the church. Saturday December 9th 7 p.m. at The Prince Royal’s College Chapel. Sunday Morning Eucharist at 11 a.m. Midnight Mass at 11:30 p.m.
Family Eucharist at 11 a.m. followed by shared lunch. There will be a sign up sheet for this traditional sit-down Christmas Lunch.